The tar road is in good condition, and rises from either side to a peak at the halfway point of the pass. There are lots of opportunities to join the trails for an off-road adventure. In winter, water runs off the mountain, and there’s deep, green vegetation, and colourful, flowering fynbos. Start from the Hout Bay side early in the morning, when the sun is looking over your shoulder from behind. Sunsets in the evenings are equally fantastic. Chappies forms part of the 56-kilometre Two Oceans ultra. But by the time you hit it, you’re already 27 kilometres into your race, with 29 still left to go. At this stage, you may not be in the best state to fully appreciate your beautiful surroundings. That’s why running Chappies at leisure is more of a treat – stopping regularly to take in the views is a must. There are public bathrooms just after the tollgate; and close to the ablution block is a mini waterfall, which is signposted from the mountain side of the road, and runs with refreshing, cold water between May and January. Café Roux, at the Noordhoek Farm Village, serves delicious post-run breakfasts – and even has a well-equipped children’s playground. Since this majestic section of road became a privatised stretch – you have to pay a toll, if you want to travel by car – there is far less traffic for runners to contend with. 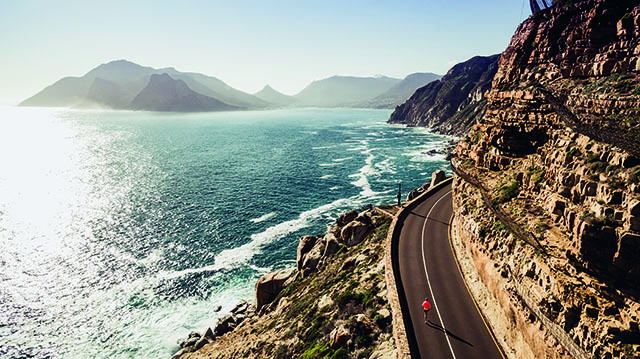 This is one of the most scenic (and downright incredible) running routes South Africa has to offer. The route is 10 kilometres long. Running on the sea side of the pass is best; for the most part, there’s a hard shoulder that’s ample for you to run on safely – even two abreast, with a buddy. There are a few short segments on the Noordhoek side where you’ll have to stop and wait for cars travelling towards Hout Bay to pass; but there’s enough space to do so in safety. Traffic doesn’t tend to be an issue unless it’s a particularly busy summer day, or during tourist season. Five kilometres into the pass, from either side, you’ll reach the main viewpoint – the vistas of the Atlantic Ocean from this spot are as spectacular as it gets! From here, either keep going and do the full 20-kilometre out-and-back; or for a shorter 10-kilometre option, simply turn and run back the way you came (or carry on, and arrange for someone to pick you up on the other side). 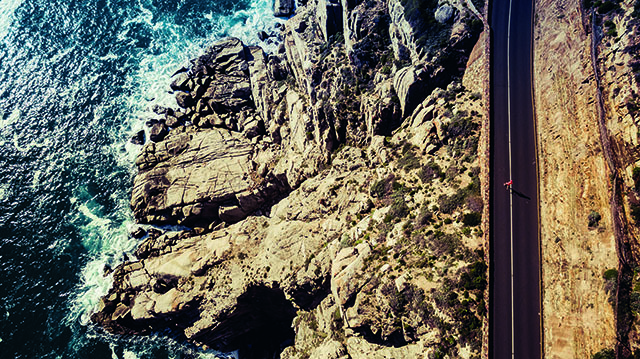 There is safe – and free – parking outside the Velocity Gym and Vida e Caffè in Hout Bay, which is situated at the foot of Chapman’s Peak Drive. Starting from the Noordhoek side? Your best bet is to park at the Noordhoek Farm Village. If you’re pressed for time, or simply want to run a shorter distance, there is parking at East Fort, which is situated two kilometres into the pass from the Hout Bay side.